Dexters are supposed to be a dual purpose breed. 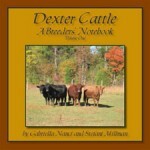 Yet, unlike commercial diary breeds, there is almost no information available within Dexter literature on udder conformation. Furthermore, few Dexter breeders actually milk their Dexters. This has led to a number of theoretical substitutions for actual selection for milking ability. Basically, people have tried to use pedigree analysis and various unrelated genetic tests; rather than looking at the animal and judging its udder conformation. Here are some common myths. Figure 1: This cow's body condition does not mean she is "dairy type," it means she is 150 pounds underweight. Many of the animals labeled “dairy-type” are simply undernourished or poorly conformed, (Figure 1). Being angular and rangy does not mean the animal will milk well, or will have decent udder conformation. It just means the cow is angular and rangy. Furthermore, this same mentality will often label an animal with good width as “beef-type” to somehow make them seem undesirable as milkers. Yet, animals with width between their rear legs are easier to milk, and usually have a wider rear udder attachment, which holds up better, especially after the third lactation. Figure 2: An obvious example of a cow from "milking lines" with an inferior udder. This cow has a good front udder attachment, but her teat placement is so poor that machine or hand milking would be impossible. She also has a weak rear udder attachment. Having a British dairy line in her pedigree is not enough to compensate for all the other influences. People will describe animals as coming from a “dairy line” if it has one of several “Dexter dairy bulls” in their pedigree. The problem is these bulls were often bred for other reasons, such as red or dun coloring, and were bred to cows with inferior udders. Worse yet, some of these bulls had a lot of milk production behind them, and were bred to cows with weak udder suspension, resulting in heifers with increased production and little support to hold it together. This can cause various problems including udders that tip forward, pear shaped teats, or udders that hang below the hocks. “Shortleg” is the term used in America to refer to a dwarf or chondrodysplasia carrier. Shortlegs and big udders can be a bad mix. First of all, extremely large udders in a Dexter are usually a sign of udder weakness. Often, their median suspensory ligament is weak, (they lack the crack up the middle of the bag, when viewed from behind). On a shortlegged cow, large udders suffer more trauma when they walk around, which can put trace blood in the milk; and they are much more likely to step on their bags when they are getting up, in some cases perforating the udder wall or teat. Shortleg enthusiasts should breed for udders with the highest rear udder attachments and good strong median udder support; basically keep the bags as high and tight as possible. A nearly ideal udder produced by one of our homozgygous polled bulls. Genetically, the two traits are completely unrelated. However, the British bull, Saltaire Platinum, was the source of the most common polled mutation in the American Dexter population. 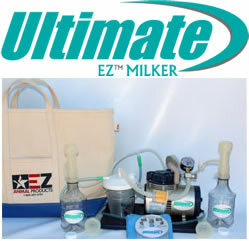 He also made huge contributions in the way of improving udder conformation. Not that all polled animals have good udders, many do not, but it is not the influence of Saltaire Platinum that gave them the problem. The Belle Fourche/Hillview breeding program used Saltaire Platinum both to improve udders and to introduce the polled allele into the herd. These tests make no claims in the way of udder conformation; the first has little support in the literature thus far, the latter two are linkage tests that have been proven effective in commercial breeds, but may mean nothing to Dexters, the lattermost test may actually select for lower butterfat. “This animal’s genetic profile, (SNP panel) says she has good milk fat and protein content, progeny pregnancy rates, productive life span, maternal characteristics, etc., etc., etc. . . The genetic profile tests were derived from large correlation studies using genetic markers that seem to be related to certain desirable, quantifiable traits in common commercial breeds. They make no claim to work on Dexters. They make little claim towards actual udder conformation, but again, we could always just look at the cow’s udder. Furthermore, Dexters excel in some of these traits already, (like butterfat). Ultimately, no test will replace the value of learning about udder conformation and breeding for a better milk cow. Remember, a Dexter cow is expected to serve her family into her late teens. This is not a requirement of commercial cattle. Figure 5: Udder on the resulting heifer sired by Serenity Oaks Farm Taco, showing improved front and rear udder attachments. Thanks for your great article. I keep finding myself at your website as I try to learn more about Dexters. Thanks again for putting this information out there. Thanks for the article! This is helpful! Good article. As someone that spent many years in various parts of the dairy business I’d say your emphasis on udder quality is spot on. Nice site overall too. Previous post: What is a throwback?